I loved the 3 day weekend, but the short week has been stressing me out a little bit. If you’re feeling the same way, I hope this will help keep you going. Dory is stuck in your head now, right? Then my job is done. I was also inspired by this cute quote graphic that Katie put together this week (and have you seen this Pinterest board? Clearly I’m obsessed.) And it’s summer, and we all know how badly I want to be in the water. Today is also the last day of May, which means my swap buttons will get switched tomorrow! I want to thank these ladies for swapping with me, make sure you check out these awesome blogs if you haven’t already! And don’t forget the Sponsor Spotlight post 1, post 2, post 3, and post 4! « how would you like yours? 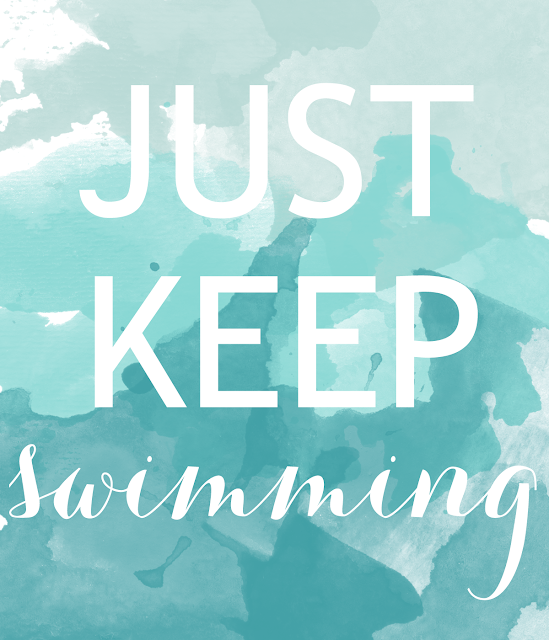 Just keep swimming! I love this – something I absolutely needed to hear. And yes, Dory is definitely swimming through my mind right now :) Happy almost-June! Thanks for the shout-out, Kate! Love your watercolor graphic too :) I continually go back to my 'Words to Live By' pinboard. Thanks for the mention! I love that graphic, and just pinned it to my quotes board. :) So true! Her little song is probably one of the best methods of stress relief ever. I love your spotlight posts. When you have space – let's swap again! I think I am going to start being a better swapper. Your program inspired me. You're always doing that. Thanks for mentioning me, Kate! I'm grateful to have such awesome blog friends, especially you! Oooh, pretty watercolors! I love it. Thanks for the sponsor love! I love this! The watercolor is beautiful!! That's one of my favorite sayings! It got me through grad school! Found you through the sponsor page. I'd love it if you visit/follow my blog as well! This week flew by for me. Faster than it should have and I'm feeling a little stressed, but I'm glad it's the weekend! Love the quote and the font! :) Have a great weekend!